You may have collected or made various GIF pictures on computer for iPhone, but only find that GIF synced from iTunes won't work in iMessage or other applications on iPhone. If the synced GIFs have no animated features, there would be less pleasure. "Why won't GIFs play on my iPhone? ", and "How to import GIFs from computer to iPhone with animation effects?" You will find the answers here. How to Import GIFs from Computer to iPhone? As GIF won't sync with iTunes, you can use DearMob iPhone Manager to transfer GIF pictures from computer to iPhone without losing the animated effects. Besides, any Live Photo, HDR pictures, Bursts and Panoramic photos can also be managed with this software. For unknown reason from Apple, GIF synced from iTunes won't work with animation features but keeps still. I have tried to import GIFs from computer to iPhone with my iTunes (my iTunes is version 12.9.0.167), but the consequence is that the GIFs will be automatically converted to JPG images that are still. So, no matter your iPhone supports GIFs or not, the GIFs synced from iTunes won't work on your iPhone with animations. One complicated yet possible way to solve GIF won't sync with iTunes problem is to text yourself the GIF pictures with iMessage and then saved to your iPhone camera roll. This way will keep the animated features after syncing, but it also requires much time. You have to selectively pick the GIFs you want to transfer from computer, and then save each one of them on iPhone one by one with your finger. That's really time-consuming, aha? Therefore, you should try an easier way – DearMob iPhone Manager. DearMob iPhone Manager is an iOS data backup transfer tool that helps backup iPhone data for data safety, and transfer iPhone photos, music, videos, contacts, messages, etc between devices for easier management. As for GIF photos sync, you can selectively or bulk transfer GIF pictures from computer to iPhone at one time and simultaneously 100% keep the animation effects. How to Import GIFs from Computer to iPhone with Animation Effects? Step 1. Download DearMob iPhone Manager, install and launch it. Step 2. USB-connect your iPhone to computer, tap "Trust" to continue if there is a popup message on your iPhone. Step 3. 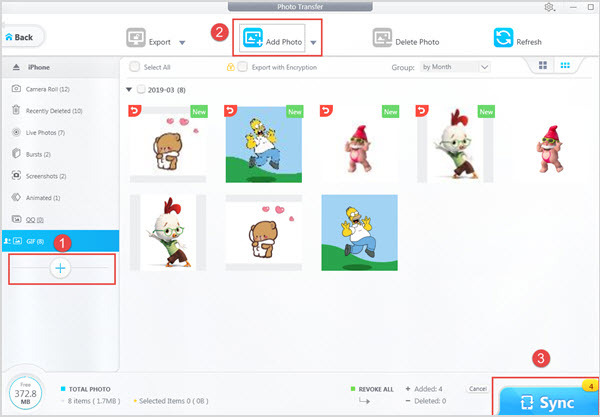 Click on Photo Transfer icon on the main interface of DearMob iPhone Manager, and then click on "+" button on the left bar to create a new folder. Step 4. After that, click on "Add Photo" icon to choose GIFs from your computer. After importing GIFs from computer to DearMob iPhone Manager, just hit "Sync" button to complete the task. Now you can view the saved GIF pictures on your iPhone or send the interesting pictures to your friends without worrying GIFs synced from iTunes won't work issue. BTW, unlike iTunes, DearMob iPhone Manager will not ask you to turn off iCloud Photos before transferring photos. Besides, DearMob iPhone Manager won't change anything of your photos, namely, you can transfer any GIF, PNG, TIFF, HEIC or BMP between computer and iPhone without changing the format and losing quality. 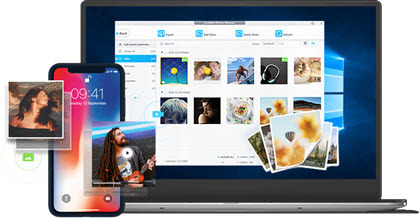 If needed, you can also use this tool to backup iPhone photos, convert Live Photo to video or still, export HEIC as JPG, delete unwanted pictures, pass-word encrypt the private photos, and more.